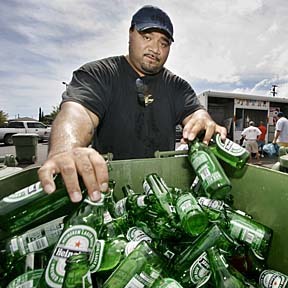 Alipate Taualupe was among those sorting his recyclable bottles and cans yesterday at the busy redemption center at Waialae and 21st avenues. Halloween offers the perfect chance to host a murder -- recreate a fictional murder scene, role-play the scenario with friends and rally your finest deductive reasoning skills to guess the killer from a group of cunning suspects. The Warrior senior was slated to start in the UH secondary during fall camp, but a sore knee limited his playing time once the season began. But over the past few weeks, Moreland showed the coaches he was healthy and ready to contribute again with his willingness to punish opponents. Upping the ante for firms competing in the local residential telephone market, Pacific LightNet Communications Inc. of Honolulu is offering unlimited long-distance, Internet-based telephone service to seven Asian nations, Guam and Australia. A Board of Education committee has approved a formula that caps decreases and increases in a school's funding at 10 percent.